1. Solomon Grundy Nichols, Dr. (George Washington4, David3, Solomon R.2, Solomon1) was born June 24, 1813 in Winchester, Franklin Co., TN, and died June 26, 1876 in Seguin, Guadalupe Co., TX. He married Martha Hannah Daniell April 19, 1842 in Gonzales, Gonzales Co., TX, daughter of George Daniell and Sylvania Pearce. She was born May 28, 1827 in Hardeman Co., TN, and died July 31, 1901 in Seguin, Guadalupe Co., TX. 2 i. Ralph Nichols, born 1843. 3 ii. Nancy Nichols, born Bet. 1846 - 1847 in TX; died Bef. 1860. 4 iii. John Franklin Nichols, born January 06, 1846; died January 02, 1866. + 5 iv. James Lucian Nichols, born August 29, 1847 in TX; died December 02, 1890. 6 v. J. Robert Nichols, born 1849. + 7 vi. Milford Riley (Mitt) Nichols, born February 19, 1851 in Gonzales, Gonzales Co, TX; died April 14, 1897 in Post, Garza Co., TX. + 8 vii. Aaron Izaac Nichols, born August 07, 1853 in Gonzales, Gonzales Co, TX; died June 30, 1935 in Jones Co., TX. + 9 viii. Mary Sylvania Nichols, born January 15, 1856 in Gonzales, Gonzales Co, TX; died January 18, 1938. 10 ix. Susan Minerva Nichols, born May 19, 1858 in Gonzales, Gonzales Co, TX; died February 19, 1891. She married Thomas J. Sheffield February 17, 1876. + 11 x. George William (G.W.) Nichols, born September 17, 1861 in Gonzales, Gonzales Co, TX; died March 1931. + 12 xi. Martha Isabell Nichols, born April 09, 1863 in Gonzale, Gonzales Co., TX; died February 11, 1899 in Probably Bexar Co., TX. + 13 xii. Alice Lucinda Nichols, born February 02, 1866 in Guadalupe, Guadalupe Co., TX; died October 08, 1945 in Corpus Christi, Nueces Co., TX. + 14 xiii. Solomon Lee Nichols, born March 12, 1873 in Gonzales, Gonzales Co, TX; died June 08, 1914. 5. James Lucian Nichols (Solomon Grundy5, George Washington4, David3, Solomon R.2, Solomon1) was born August 29, 1847 in TX, and died December 02, 1890. He married Sarah Frances Land April 09, 1868. She was born November 1847 in TX, and died February 16, 1910. + 15 i. Rhoda Ann Nichols, born May 23, 1869 in Seguin, Guadalupe Co., TX; died October 24, 1956 in San Antonio, Bexar Co., TX. + 16 ii. Mattie Clemmie Nichols, born March 08, 1870; died November 28, 1959 in San Antonio, Bexar Co., TX. + 17 iii. James Milton (Mitt) Nichols, born September 21, 1872 in Bexar Co., TX; died January 27, 1949 in San Antonio, Bexar Co., TX. 18 iv. Walter Gilbert Nichols, born April 15, 1877; died May 28, 1916. He married ---- Franklin. 19 v. Thomas Lee (Jakie) Nichols, born March 30, 1880; died February 07, 1883. 20 vi. Lucian Burl Nichols, born April 04, 1884 in Nixon, Gonzales Co., TX; died June 29, 1951 in Nixon, Gonzales Co., TX. He married T.Pearl Jones October 10, 1909; born 1880; died 1973. + 21 vii. Claude Elmer Nichols, born March 13, 1887 in Wilson Co., TX; died November 16, 1968 in Burnet, Burnet Co., TX. 7. Milford Riley (Mitt) Nichols (Solomon Grundy5, George Washington4, David3, Solomon R.2, Solomon1) was born February 19, 1851 in Gonzales, Gonzales Co, TX, and died April 14, 1897 in Post, Garza Co., TX. He married Isabel Graham Sowell November 14, 1876 in Guadalupe Co., TX ... by George Daniell, Minister, daughter of Asa Sowell and Mary Turner. She was born February 07, 1859 in Gonzales, Gonzales Co, TX, and died November 24, 1949 in Post (Verbina), Garza Co., TX. + 22 i. Milford Lee (Mittie Lee) Nichols, born October 1877 in Seguin, Guadalupe Co., TX; died September 19, 1923 in Flagstaff, Cococino Co., AZ. 23 ii. Pleamon Y. Sowell Nichols, born December 1878 in Seguin, Guadalupe Co., TX; died December 14, 1956 in Post, Garza Co., TX. 24 iii. Mabel Nichols, born April 03, 1881; died December 14, 1887. + 25 iv. Ethel Mae Nichols, born October 10, 1882 in Post, Garza Co., TX; died February 12, 1912. 26 v. Inez Nichols, born May 02, 1885; died October 16, 1886. + 27 vi. Norman Rae Nichols, Rev., born April 05, 1886 in Seguin, Guadalupe Co., TX; died April 20, 1969 in Seattle, King Co., WA. 28 vii. John Sowell Nichols, born August 31, 1889 in Post, Garza Co., TX; died May 01, 1979 in Post, Garza Co., TX. + 29 viii. Winifred Iona Nichols, born February 01, 1892 in Post, Garza Co., TX; died October 05, 1973. 30 ix. Claude Aron Nichols, born July 01, 1894 in Post, Garza Co., TX; died April 12, 1913 in Post, Garza Co., TX. 31 x. Henrietta Sowell Nichols, born September 04, 1896 in Post, Garza Co., TX; died October 19, 1986 in Post, Garza Co., TX. 8. Aaron Izaac Nichols (Solomon Grundy5, George Washington4, David3, Solomon R.2, Solomon1) was born August 07, 1853 in Gonzales, Gonzales Co, TX, and died June 30, 1935 in Jones Co., TX. He married Annie Hadden January 17, 1883 in Guadalupe Co., TX ... by T. J. Dodson, MG. She was born August 01, 1861 in Scotland, and died January 25, 1896. + 32 i. Morgan Lewis7 Nichols, born February 27, 1891 in TX; died June 06, 1961 in Coleman Co., TX. 33 ii. Della Martha O. Nichols, born June 27, 1885; died October 23, 1974. She married George Walter Thorn November 22, 1908; born June 26, 1886; died February 06, 1981. + 34 iii. Susie M. Nichols, born September 1889 in TX. 35 iv. 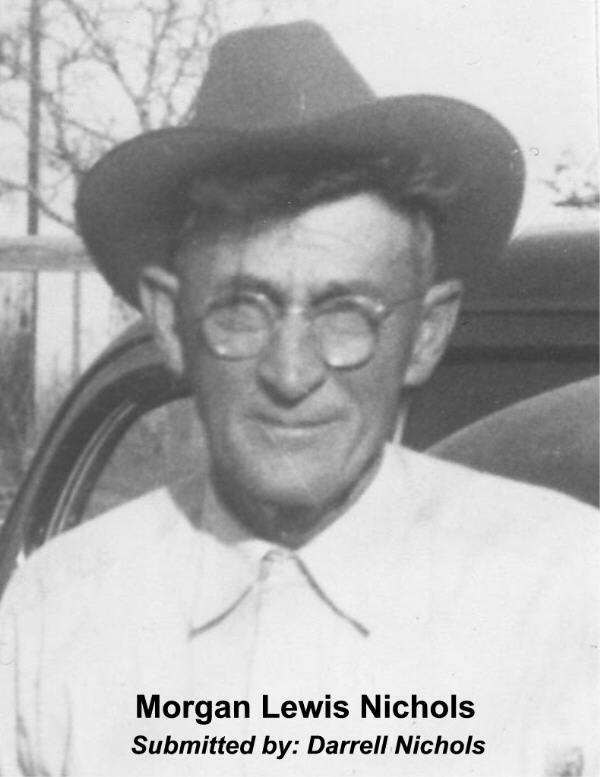 Lane Riley Nichols, born August 27, 1893 in TX; died June 04, 1964 in Jones Co., TX. 9. Mary Sylvania Nichols (Solomon Grundy5, George Washington4, David3, Solomon R.2, Solomon1) was born January 15, 1856 in Gonzales, Gonzales Co, TX, and died January 18, 1938. She married Haynes L. Morgan November 15, 1876 in Gonzales, Gonzales Co., TX. He was born 1850 in TX. 36 i. John B. Morgan, born 1877 in TX. 37 ii. James H. Morgan, born 1880 in TX. 11. George William (G.W.) Nichols (Solomon Grundy5, George Washington4, David3, Solomon R.2, Solomon1) was born September 17, 1861 in Gonzales, Gonzales Co, TX, and died March 1931. He married Josephine Harris December 23, 1880 in Probably Guadalupe Co., TX, daughter of James Harris and Mary ----. She was born 1862 in TX. 38 i. Jasper W. Nichols, born November 1882 in TX. 39 ii. Mary S. Nichols, born November 1884 in TX. + 40 iii. Arthur L. Nichols, born May 01, 1887 in TX; died May 01, 1969 in Trinity Co., TX. + 41 iv. Earl Lionel Nichols, born April 22, 1892 in TX; died December 09, 1936 in Trinity Co., TX. + 42 v. John Franklin (Johnny) Nichols, born May 20, 1895 in TX; died November 12, 1976 in Houston Co., TX. + 43 vi. Norman Harrison Nichols, born May 1898 in TX; died 1964 in Trinity Co., TX. + 44 vii. Loraine Nichols, born April 12, 1902; died April 05, 1983. 12. Martha Isabell Nichols (Solomon Grundy5, George Washington4, David3, Solomon R.2, Solomon1) was born April 09, 1863 in Gonzale, Gonzales Co., TX, and died February 11, 1899 in Probably Bexar Co., TX. She married Henry O'Neal Terrell December 18, 1884. He died June 08, 1914. 45 i. Loy? Ferrell, born September 1885. 46 ii. Loula Ferrell, born May 1888. 47 iii. Clara Belle Ferrell, born March 1890. 13. Alice Lucinda Nichols (Solomon Grundy5, George Washington4, David3, Solomon R.2, Solomon1) was born February 02, 1866 in Guadalupe, Guadalupe Co., TX, and died October 08, 1945 in Corpus Christi, Nueces Co., TX. She married Nathaniel Benton III December 18, 1884, son of Nathaniel Benton and Jane Harris. He was born August 18, 1860 in Guadalupe Co., TX, and died January 16, 1931 in Corpus Christi, Nueces Co., TX. + 48 i. Irene Benton, born July 1887 in TX; died March 02, 1959 in Corpus Christi, Nueces Co, TX. 49 ii. Curran Lee Benton, born November 1889 in TX. He married Corinne C. Bernard May 04, 1917; died March 05, 1919. 14. Solomon Lee Nichols (Solomon Grundy5, George Washington4, David3, Solomon R.2, Solomon1) was born March 12, 1873 in Gonzales, Gonzales Co, TX, and died June 08, 1914. He married Lillian Mary Parsons September 25, 1895 in Bexar Co., TX, daughter of William Parsons and Mary ----. She was born August 1875 in Bath, England. 50 i. Lucille Athins, born July 1892 in TX. 15. Rhoda Ann Nichols (James Lucian6, Solomon Grundy5, George Washington4, David3, Solomon R.2, Solomon1) was born May 23, 1869 in Seguin, Guadalupe Co., TX, and died October 24, 1956 in San Antonio, Bexar Co., TX. She married James (Jim) Burbank Crow. He was born 1869 in La Vernia, Wilson Co., TX. 51 i. Ruby Lewis Crow, born 1892. She married Samuel Troy Spivey. 52 ii. Clemmie Gilbert Crow, born July 01, 1900. She married E.C. Schleyer. 53 iii. James Rhoda Crow, born September 26, 1903. She married Jackie Connevey. 16. Mattie Clemmie Nichols (James Lucian6, Solomon Grundy5, George Washington4, David3, Solomon R.2, Solomon1) was born March 08, 1870, and died November 28, 1959 in San Antonio, Bexar Co., TX. She married Charles A. (Charlie) Ridout Abt. 1895. He was born October 1870 in MS.
54 i. Allen Ridout, born May 1897 in TX. He married Loyce ----; born 1897 in TX. 55 ii. Sadie (Sarah) Ridout, born 1910. 17. James Milton (Mitt) Nichols (James Lucian6, Solomon Grundy5, George Washington4, David3, Solomon R.2, Solomon1) was born September 21, 1872 in Bexar Co., TX, and died January 27, 1949 in San Antonio, Bexar Co., TX. He married Maggie Carpenter November 17, 1894 in Wilson Co., TX. She was born 1874 in TX. 56 i. Effie C. Nichols, born 1892; died October 20, 1971 in Bexar Co., TX. She married Oliver Magee. 57 ii. Jimmy Lewis (Jim) Nichols, born 1899. He married Susie Fisher 1923; born 1907 in TX. 58 iii. Elvin Nichols, born September 20, 1900; died September 07, 1977 in San Antonio, Bexar Co., TX. He married Effie Pomelia Warren 1924; died March 21, 1988 in Tarrant Co., TX. 59 iv. Milton Nichols, born October 01, 1902; died May 1974. 60 v. Pearl Nichols, born 1906; died 1991 in San Antonio, Bexar Co., TX. She married Otto Spear; born August 06, 1902; died May 1973 in San Antonio, Bexar Co., TX. 61 vi. Margarete Nichols, born 1908. She married Wesley Null. 62 vii. Grover Claud Nichols, born August 21, 1910; died April 13, 1989 in Bexar Co., TX. He married Leah Frances Wheeler. 63 viii. Grace Nichols, born 1913. She married Edwin Wheeler. 64 ix. Maggie Nichols, born December 22, 1913. She married Odell Alvano Cobb. 65 x. Opal Faye Nichols, born August 19, 1915; died January 31, 1994. She married Henry Clay Lee, Jr.; born April 04, 1909; died January 11, 1992. 21. Claude Elmer Nichols (James Lucian6, Solomon Grundy5, George Washington4, David3, Solomon R.2, Solomon1) was born March 13, 1887 in Wilson Co., TX, and died November 16, 1968 in Burnet, Burnet Co., TX. He married Earnest Ethel Kyser December 27, 1913 in San Benito Co., TX, daughter of George Kyser and Adella Barnett. She was born December 24, 1895 in Kerns, Navarro, Texas, and died September 24, 1961 in Burnet, Burnet Co., TX. 66 i. (Living) Nichols, born June 17, 1921 in San Antonio, Bexar Co., TX. He married (Living) Moore July 06, 1951 in First Baptist Church, Bertram, Burnet Co., TX; born July 06, 1929 in Hunt, Kerr Co., TX. 67 ii. James Henry Nichols, born January 23, 1918 in TX; died June 07, 1989 in California. He married Lucille Emma Whittaker. 68 iii. Della Mae Frances Nichols, born November 04, 1919 in TX. She married Oliver Wesley Sumerlin June 15, 1941; born September 27, 1912; died June 1986 in Probably Cameron Co., TX. 69 iv. Claude Everett Nichols, born March 03, 1915 in TX; died September 06, 1983 in TX. He married Leona McClaugherty; born May 07, 1916; died December 24, 1976 in TX. 70 v. Lois Ethel Nichols, born July 05, 1916 in TX; died July 05, 1984. She married William M. Haverfield; died August 05, 1991. 22. Milford Lee (Mittie Lee) Nichols (Milford Riley (Mitt)6, Solomon Grundy5, George Washington4, David3, Solomon R.2, Solomon1) was born October 1877 in Seguin, Guadalupe Co., TX, and died September 19, 1923 in Flagstaff, Cococino Co., AZ. He married May Retta Lester Abt. 1898 in Weatherford, TX, daughter of James Lester and Mayretta Mitchell. She was born November 07, 1881 in Howell Co. MO, and died October 1969 in Albuquerque, Bernalillo Co., New Mexico. 71 i. Roland Leon Nichols, born November 11, 1900 in Weatherford, Parker Co., Texas; died September 27, 1968 in North Hollywood, Los Angeles Co., California. He married Mary Comstock in Los Angeles, California. 72 ii. Lorena Geneva Nichols, born March 16, 1902 in Snyder, Curry Co. Texas; died July 10, 1982 in Truth or Consequences, Sierra Co. NM. She married (1) Herbert Bradford Hill September 1923; born September 1904 in Magdalena, New Mexico; died 1940. She married (2) Gail Berrif June 1943 in Alamogordo. She married (3) Clifford M. Miller Aft. 1944; born Bet. 1886 - 1905; died 1972 in Truth or Consequences, NM. She married (4) Lawrence Tidwell 1977; died 1982 in Truth or Consequences, Sierra Co. NM. 73 iii. Georgia Bell (Aunt Doddie) Nichols, born February 27, 1905 at her grandparents (Lester) farm near Grady, Van Zandt County, TX; died August 27, 1992 in AZ. She married Jack Goats Johnson September 17, 1930; born November 13, 1905; died January 10, 1966. 74 iv. Lester Milford Nichols, born March 17, 1907 in Coronado, Greenlace Co., Arizona; died December 16, 1988 in Post, Garza Co., TX. He married Estalen Windham November 21, 1930; born April 25, 1912; died February 19, 1972. 75 v. Pleamon Riley Nichols, born April 04, 1908 in Metcalf, Graham Co., Arizona; died Bet. 1908 - 1912 in Arizona. 76 vi. Herbert Lee (Tex) Nichols, born July 07, 1910 in Coronado, Greenlace, Arizona; died July 23, 1940 in Cloudcroft. 25. Ethel Mae Nichols (Milford Riley (Mitt)6, Solomon Grundy5, George Washington4, David3, Solomon R.2, Solomon1) was born October 10, 1882 in Post, Garza Co., TX, and died February 12, 1912. She married Ruben Lynn Lester, son of Richard Lester and May Mitchell. 77 i. Hazel Mae Lester, born February 05, 1902; died May 19, 1960. She married James Henry Miller 1923; born March 31, 1902; died February 06, 1962. 27. Norman Rae Nichols, Rev. (Milford Riley (Mitt)6, Solomon Grundy5, George Washington4, David3, Solomon R.2, Solomon1) was born April 05, 1886 in Seguin, Guadalupe Co., TX, and died April 20, 1969 in Seattle, King Co., WA. He married Ethel Lester July 04, 1909 in Mabank (Roddy), Van Zant Co., TX, daughter of James Lester and Mayretta Mitchell. She was born April 20, 1892 in Mabank (Roddy), Van Zant Co., TX, and died January 31, 1981 in Whittier, Los Angeles Co., CA. 78 i. Edith Nichols, born October 09, 1910 in Metcalf, Coranado Hill Co., AZ; died 1912 in Metcalf, Coranado Hill Co., AZ. 79 ii. Richard Clemons (Cal) Nichols, born March 18, 1913 in Phoenix, AZ; died February 09, 1983 in Flagstaff, AZ. He married (1) Esther A. Siegal. He married (2) Mary Ann Pape. 80 iii. Milford Nichols, born February 01, 1914 in Phoenix, AZ; died March 1914 in Phoenix, AZ. 81 iv. Norman Rae Nichols, Jr., born February 18, 1916; died April 05, 1987 in Shelton, WA. He married Ruth May Herring. 82 v. Annabelle Nichols, born January 09, 1918. She married Warren L. Hill, IV. 83 vi. Ethel Graham Nichols, born October 15, 1921; died 1936. 84 vii. Lorae Iona Nichols, born June 09, 1922. She married Robert Raymond Lucas. 85 viii. (Private) Nichols, born January 18, 1925. He married (Private) Arnett; born August 27, 1926 in TX; died February 18, 1985. 86 ix. (Living) Nichols, born June 09, 1927. He married (Living) Howell; born Abt. 1928. 87 x. (Living) Nichols, Dd, born August 29, 1929. He married (Living) Jones. 29. Winifred Iona Nichols (Milford Riley (Mitt)6, Solomon Grundy5, George Washington4, David3, Solomon R.2, Solomon1) was born February 01, 1892 in Post, Garza Co., TX, and died October 05, 1973. She married Wilbur Evans Blake Bet. 1904 - 1934. He was born May 09, 1881, and died January 22, 1958. 88 i. Frances (Franses) Isabel Blake, born October 28, 1912; died June 14, 1933. 89 ii. Herman Nichols Blake, born July 19, 1914; died October 06, 1916. 90 iii. (Private) Blake II. He married Barbara (Private) Ryerson. 32. Morgan Lewis Nichols (Aaron Izaac6, Solomon Grundy5, George Washington4, David3, Solomon R.2, Solomon1) was born February 27, 1891 (1889) in TX, and died June 06, 1961 in Coleman Co., TX. He married (1) Lois Dyer who died. He married (2) Eula M. Stephens. She was born September 04, 1899; died August 19, 1990. Both buried in Atoka Cemetery, Novice, TX. 93 iii. Mary Anna Nichols, born 1919. 94 iv. infant (Dale) Nichols, born July 22, 1926 in Coleman Co., TX; died July 22, 1926 in Coleman Co., TX. Buried in Atoka Cemetery, Novice, TX. 95 v. Dock Aron Nichols, born August 14, 1933 in Coleman Co., TX; died March 2, 2005. Buried in Atoka Cemetery, Novice, TX. 34. Susie M. Nichols (Aaron Izaac6, Solomon Grundy5, George Washington4, David3, Solomon R.2, Solomon1) was born September 1889 in TX. She married Willie R. Blanton 1910. He was born 1888 in AL. 96 i. Willie R. Blanton,Jr., born 1915 in TX. 40. Arthur L. Nichols (George William (G.W. )6, Solomon Grundy5, George Washington4, David3, Solomon R.2, Solomon1) was born May 01, 1887 in TX, and died May 01, 1969 in Trinity Co., TX. He married Georgia F. Bayne. She was born September 05, 1890 in TX, and died September 28, 1975 in Trinity Co., TX. 97 i. Ola May Nichols, born December 03, 1912 in TX. She married William Harper O'Pry May 21, 1932; born January 30, 1910; died June 12, 1995. 98 ii. Jim Roy Nichols, born 1918 in TX. 99 iii. Norman L. Nichols, born 1922 in TX. 100 iv. Calvin Andrew Nichols, born August 23, 1924 in TX; died April 25, 1996 in Trinity Co., TX. He married Jennie Louise Thompson. 101 v. Opal Joyce Nichols, born November 25, 1930 in Trinity Co., TX. She married (Private) Rogers. 41. Earl Lionel Nichols (George William (G.W. )6, Solomon Grundy5, George Washington4, David3, Solomon R.2, Solomon1) was born April 22, 1892 in TX, and died December 09, 1936 in Trinity Co., TX. He married Ola Mae Stutts. She was born 1903 in TX, and died April 10, 1970. 102 i. Mildred Nichols, born 1916. She married John Leonard Parker. 103 ii. Glen Lionel Nichols, born May 30, 1917 in TX; died May 27, 1998 in Trinity Co., TX. He married Maxine L. Burns March 18, 1934 in Houston Co., TX; born October 22, 1915 in TX; died March 02, 1980 in Trinity Co., TX. 104 iii. Wilma Jewell Nichols, born 1920 in TX. She married (Private) Anderson. 105 iv. Myrtle Lee Nichols, born Abt. 1924. She married (1) Robert Antley. She married (2) Robert Chick. 106 v. Robert Chester Nichols, born June 14, 1926 in Trinity Co., TX. He married Thelma Lois Hathorne. 107 vi. Winfred Rudolph Nichols, born July 14, 1928 in Trinity Co., TX. 42. John Franklin (Johnny) Nichols (George William (G.W. )6, Solomon Grundy5, George Washington4, David3, Solomon R.2, Solomon1) was born May 20, 1895 in TX, and died November 12, 1976 in Houston Co., TX. He married Nannie Ola (Nanoler) Greer 1920, daughter of Joseph? A. Greer. She was born November 14, 1899 in TX, and died December 28, 1977 in Houston Co., TX. 108 i. Everett Leeland Nichols, born 1921; died September 1985 in Angelina Co., TX. He married Bessie Marie Barnett Sanders January 01, 1946 in Houston Co., TX. 109 ii. Rachel Nichols, born 1924; died Bef. 2004. She married ---- Reynolds. 110 iii. Mary Josephine Nichols, born March 04, 1926 in Walker Co., TX; died March 19, 2004 in At home in Austonio, Houston, Co., TX. She married Buford L. Adams; born 1916 in TX. 111 iv. Margaret Inez Nichols, born April 21, 1928 in Trinity Co., TX. 112 v. Leo F. Nichols, born March 03, 1930 in Trinity Co., TX; died January 01, 1990 in Dallas, Dallas Co., TX. He married (1) Peggy J. ----. He married (2) Almeda Payne June 07, 1976 in Dallas Co., TX; born 1915. 113 vi. Harold Nichols, born in Trinity Co., TX. 114 vii. (Living) Nichols. She married (Living) Walker. 43. Norman Harrison Nichols (George William (G.W. )6, Solomon Grundy5, George Washington4, David3, Solomon R.2, Solomon1) was born May 1898 in TX, and died 1964 in Trinity Co., TX. He married Ellen Magdelene (Maggie) Vinson. She was born June 07, 1896 in TX, and died January 24, 1976. 116 i. Normalee Nichols. She married Lee Barksdale. 117 ii. Telma Rubine Nichols. 44. Loraine Nichols (George William (G.W. )6, Solomon Grundy5, George Washington4, David3, Solomon R.2, Solomon1) was born April 12, 1902, and died April 05, 1983. She married (1) ---- Sikes. She married (2) ---- Hollis. 48. Irene Benton (Alice Lucinda6 Nichols, Solomon Grundy5, George Washington4, David3, Solomon R.2, Solomon1) was born July 1887 in TX, and died March 02, 1959 in Corpus Christi, Nueces Co, TX. She married Herbert Norman Garrett October 02, 1907 in Corpus Christi, Neuces Co., TX. He was born March 18, 1865 in Rochester, Olmstead Co., MN, and died July 03, 1929 in Kerrville, Kerr Co., TX. 119 i. Herbert Norman Garrett, Jr., born July 22, 1909 in Corpus Christi, Nueces Co, TX. He married Susan Elizabeth Jackson February 01, 1938 in Corpus Christi, Neuces Co., TX. 120 ii. Jane Elizabeth Garrett, born May 05, 1911 in Corpus Christi, Nueces Co, TX. 121 iii. Harry Benton Garrett, born April 13, 1914 in Alpine, Brewster Co., TX. He married Cornelia Evans Glazbrook October 24, 1936 in Corpus Christi, Neuces Co., TX; born March 18, 1916 in LaJunta, CO.
122 iv. Curran Lee Garrett, born July 20, 1919 in Corpus Christi, Nueces Co, TX. He married Frances Juanita Glass August 03, 1946 in Conroe, Montgomery Co., TX; born December 30, 1918 in Onalaska, TX; died April 12, 1982 in Corpus Christi, Nueces Co, TX. 123 v. John Henry Garrett, born June 20, 1921 in Corpus Christi, Nueces Co, TX; died June 07, 1936 in Corpus Christi, Nueces Co, TX.